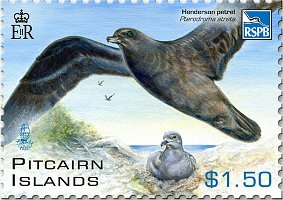 Henderson Island is part of the Pitcairn Group and was designated a World Heritage site in 1993. Renown for having the largest pristine raised coral atoll in the world and an ecology that has remained intact from human activity, Henderson Island is in trouble. With four endemic bird species, eight snails and nine plants found nowhere else in the world, Henderson is also home to marine turtles and twelve different seabird species, including four types of petrel. 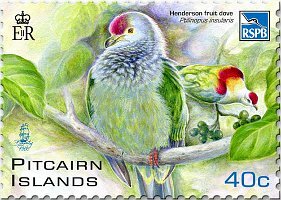 This stamp issue focuses on the rare endemic birds, namely the Henderson crake Porzana atra ; the Henderson fruit dove Ptilinopus insularis ; the Henderson reed warbler Acrocephalus taiti ; the Henderson lorikeet Vini stephani and gives special attention to the Henderson petrel Pterodroma atreta. It is the plight of the petrel that has captured the attention of the Royal Society for the Protection of Birds and they have initiated the Henderson Island Restoration Project which involves the planned eradication of introduced rats that are driving the Henderson petrel towards extinction. Over 95% of petrel chicks on Henderson are killed by rats within one week of hatching - over 25,000 chicks every year. These rats are also competing with the other land birds and therefore may be limiting their populations. In August-September 2011, the RSPB operational vessel will be at Henderson, carrying two helicopters that will use GPS technology to methodically drop poison bait across the entire island. This highly targeted, short-term intervention will bring really long-term benefits: the Henderson petrel saved from its slide towards extinction, a large island restored and at least ten further unique species safeguarded for future generations to enjoy. The overall cost of the eradication project is in the region of GBP £1.5 – 1.7m. 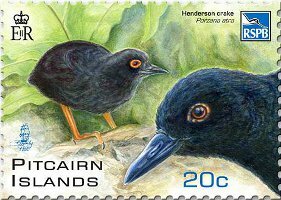 The RSPB is seeking help with remaining funding and the Pitcairn Islands Philatelic Bureau has agreed to donate $NZ1.00 for every Henderson Bird set of stamps or First Day Cover purchased. 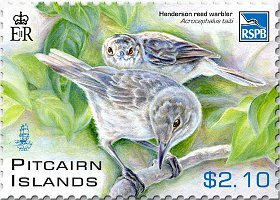 The RSPB and the Philatelic Bureau thank you in anticipation for your help in saving the bird life of Henderson. 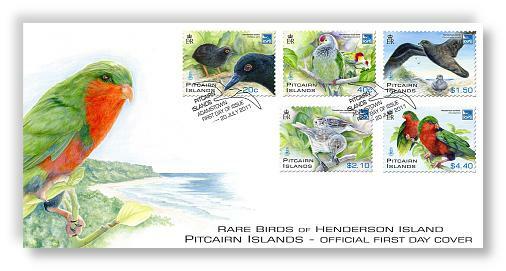 Note: The third Premier Collectors’ Edition is now released and the Rare Birds of Henderson is the subject for 2011. 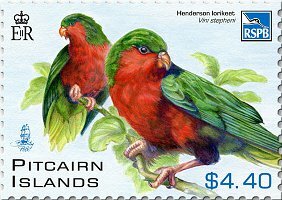 The Henderson lorikeet features in the colour separations and progressives. The Collectors Editions are strictly limited to 200 packs and are available from 20 July 2011 until sold out. To ensure you obtain the third edition in this series, please order here.